2-Ingredient Creamy Salsa Dip - literally takes 1 minute to make! I am totally addicted to this dip! 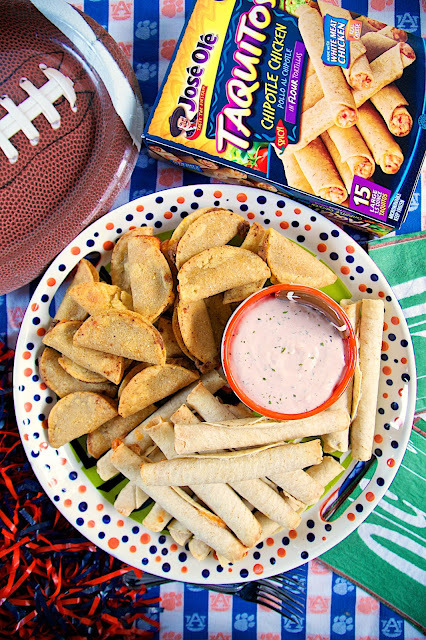 !Pair with some José Olé frozen snacks for an easy tailgating feast! Also great on a salad or on top of a baked potato. We do a lot of tailgating this time of year. A whole lot! I am always trying to come up with super easy recipes. I had some of our favorite quick snacks, José Olé Taquitos, in the freezer and decided to serve them with an easy 2-Ingredient Creamy Salsa. OMG! The Creamy Salsa was SOOO good and literally took one minute to make. The salsa was great with our José Olé snacks, but it would also be good on regular tacos, a salad or on top of a baked potato. It is a new favorite! José Olé snacks are one of our favorites. I always have a box in the freezer. 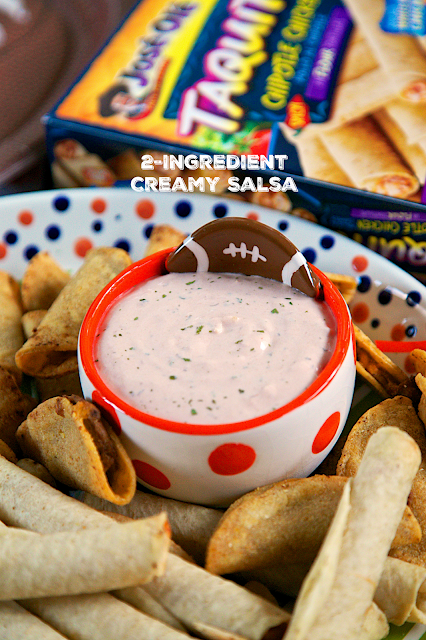 They so convenient to make for football party. Just pop them in the oven, and they are hot and crispy in under 15 minutes! They are a great way to easily feed a crowd! 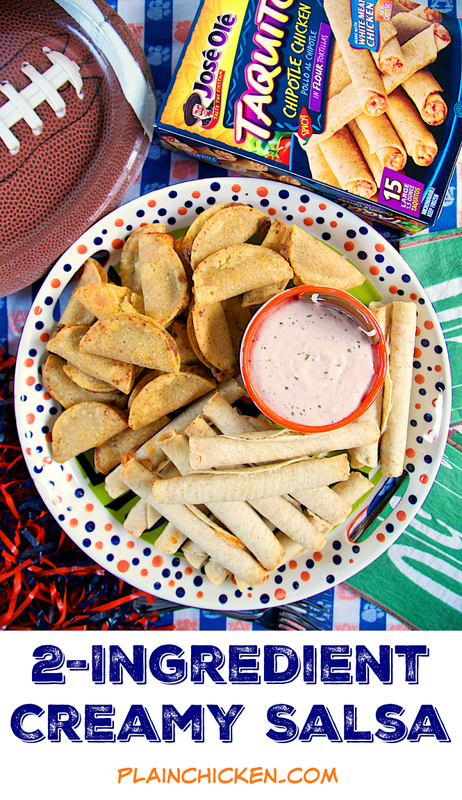 Our favorites are the Chipotle Chicken Taquitos and Beef & Cheese Mini Tacos. The Chipotle Chicken Taquitos were a little spicy. The Creamy Salsa helped cool them down a bit. If you don't like spicy food, José Olé has lots of other varieties. There is definitely something to please everyone in your group! 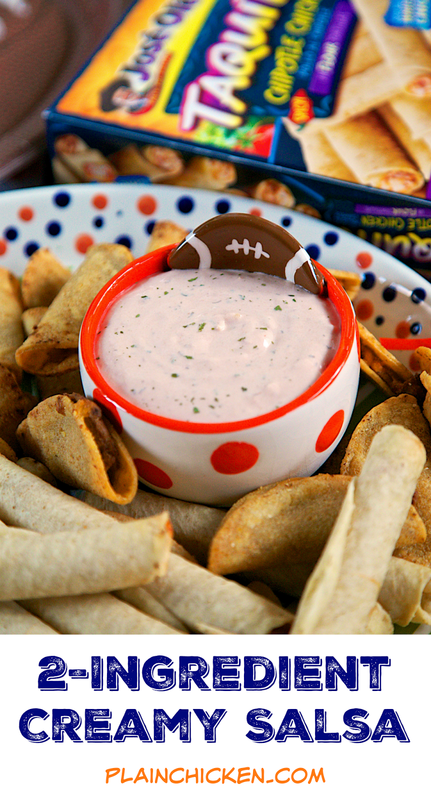 Whisk together Ranch dip and salsa. Refrigerate until ready to serve. This is a sponsored conversation written by me on behalf of JOSE OLE. The opinions and text are all mine.